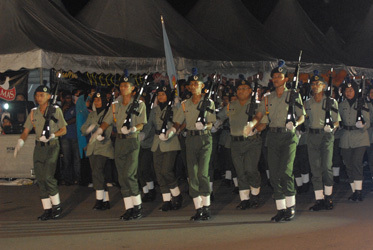 BANGI, 5 August, 2010 – University students were reminded that their involvement in organising events for the public is equally important in turning them into students of excellence able to compete in the market place once they graduated. The Cancellor of Universiti Kebangsaan Malaysia, Tuanku Muhriz Ibni Almarhum Tuanku Munawir, the Yang Dipertuan Besar Negeri Sembilan said learning is not only in the lecture halls or from their lecturers but also from their experiences in organising events for the public. 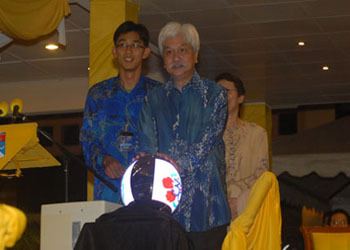 The Cancellor said this when officiating at the UKM 38th 2010 convocation fiesta at Dataran Gemilang UKM last night. The fiesta which is organised fully by the students is on until this Monday, Aug 9th. 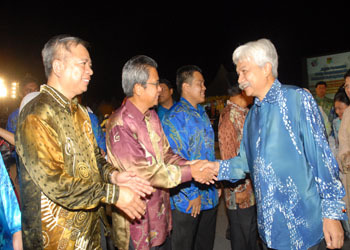 Tuanku Muhriz said that events like the fiesta is important to build close relationships and rapport between the students, UKM’s community, its alumni and the public. He commended the students for organising the fiesta which had showed their indomitabale and innovative spirit and maturity. 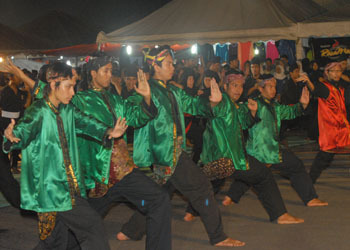 The Fiesta is one of the biggest annual events organised entirely by UKM students. Over 146 small and meduim enterprises are taking part in the fiesta. In addition a career fair exhibition is also held in collaboration with Kareer.com to enable students to gain insights into the career path they could pursue. This year the convocation fiesta added a few new items like paintball competition, various mini funfair like games and even a haunted house to keep visitors entertained. 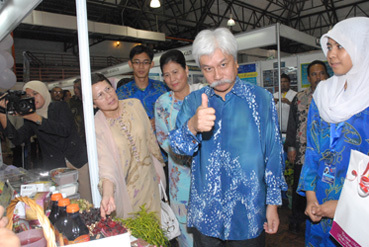 Among those present at the fiesta were Tunku Ampuan, Tuanku Aishah Rohani bt Almarhum Tengku Besar Mahmud, Chairman of the UKM Board of Directors, Tan Sri Dato’ Paduka Dr Mazlan Ahmad, the Vice Chancellor, Prof. Tan Sri Dr Sharifah Hapsah Syed Hassan Shahabuddin and senior university officials.